He is asking the rising sun which bait it prefers to be snared with. The sun is uncertain. Diet Pepsi is "the one calorie choice of the new generation" but the sun requires calories. Many calories. Null wrote: He is asking the rising sun which bait it prefers to be snared with. The sun is uncertain. Diet Pepsi is "the one calorie choice of the new generation" but the sun requires calories. Many calories. Approximately 1 x 10^14 calories per day, according to my calculations (which simply included looking up the sun's output in joules and converting it to calories). Man, Sunny better get drinking! out of curiosity, what does adding 1X contribute to an equation or statement of value? chrismachine wrote: out of curiosity, what does adding 1X contribute to an equation or statement of value? and what does that contribute here? Isn't a coefficient a defined number when combined with an object or symbol or something? Doesn't it need a variable? 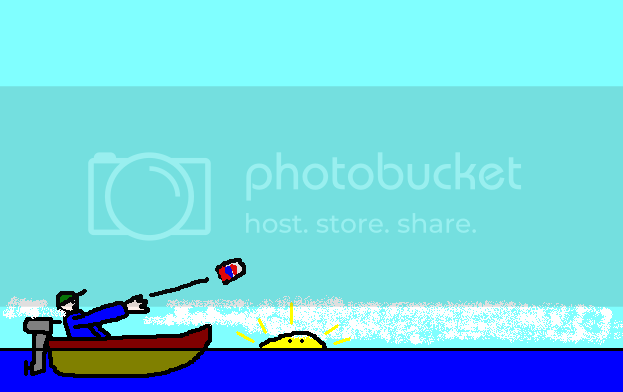 Alternatively, the fisherman actually prefers Pepsi Throwback. The sun outputs approximately 380 trillion terawatts of power (3.8 × 10²⁶ watts), which, over the course of one day (86400 seconds), comes out to about 33 quintillion terajoules (3.3 × 10³¹ joules) of energy. Converting this to calories (0.239 calories per joule) yields 7.8 quintillion teracalories (7.8 × 10³⁰ calories). Oh, but the kind of calories that we talk about with food are really Calories with a capital C, or kilocalories. So that turns out to be 7.8 quadrillion teraCalories (7.8 × 10²⁷ Calories) per day. Or we could call that 7800 yottaCalories or 7.8 octillion Calories. Blah de blah blah blah blah yadda yadda yadda blah. Yeah, sorry. My point was that kvn's calculation seems to be quite a bit off. Like, by many orders of magnitude (whether or not you multiply it by one). Your use of caps is weird too. It's like you're only kind of yelling. What? No, I was just mentioning a new trademarked product from the same people who make I Can't Believe It's Not Butter!® and Seriously, You Guys, I'm Almost Positive This is Butter™ and What Do You Mean, "This is an Unregistered Service Helping People Mysteriously Unable to Distinguish Butter From Non-Butter"? It's Butter, I Tell You! Rich, Creamy Butter! Hahahahahaaaaaaauuugggghhh!!!!!!!℠. Watch it, slydon, I think he's just trying to butter you up. The 1x refers to the number that you're multiplying by the power of 10. 1 x 10^14, 6.022 x 10^23, 6.67 x 10^-11, etc. yeah, it was basically to ask if there's a reason to include the 1 there even though it (seemingly) has no impact on the number. Is it just a useful placemarker or something so it doesn't look different when you have to add 6.22 X ? I believe it's just a mathematical standard. It's scientific notation. One reason to do this is that it gives a clearer idea of the uncertainty of the number. "1×10¹" gives a little more information than "10¹", since it has one significant figure and means "anywhere between 5 and 15". Compare this to "1.0×10¹", which has two significant figures and means "anywhere between 9.5 and 10.5". So what's the scientific notation for numbers we hear in politicians' speeches? My word people, I love math and all (I do), but even I'm already sick of this thread. I did like the comic though. Saltine wrote: It's scientific notation. One reason to do this is that it gives a clearer idea of the uncertainty of the number. "1×10¹" gives a little more information than "10¹", since it has one significant figure and means "anywhere between 5 and 15". Compare this to "1.0×10¹", which has two significant figures and means "anywhere between 9.5 and 10.5". how can you multiply 1×10¹ and have it mean 15?